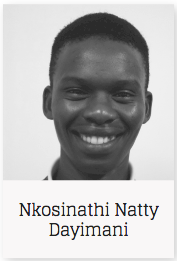 My name is Nkosinathi. I come from a community where it is hard to reach higher education. My neighbourhood is deeply impacted by drug use and crime. Without sufficient resources, it can be hard for the youth in my neighbourhood to stay in school, and even harder to get employed. This is where I come in, I want to bring back opportunities to my own community and others like it. The reason I’m enrolled at Cornerstone is that I want to become a qualified entrepreneur. Starting a business is challenging, and I’m equipping myself with the proper training and skills while I am here. Our coursework will get me up to speed on relevant business concepts and strategies, as well as provide a larger perspective on economics as a whole. There’s also a leadership component. When I graduate from here, I’ll leave as a capable and effective leader with a strong grasp of the fundamentals of running a high-calibre business. My degree program will mold me into a strong role model and help me achieve my goals of giving back to my community. I’m going to create job opportunities in my neighbourhood, and be a part of the change we need to move forward.